Sometimes all we need is one photo to convince us to pack our bags and go. 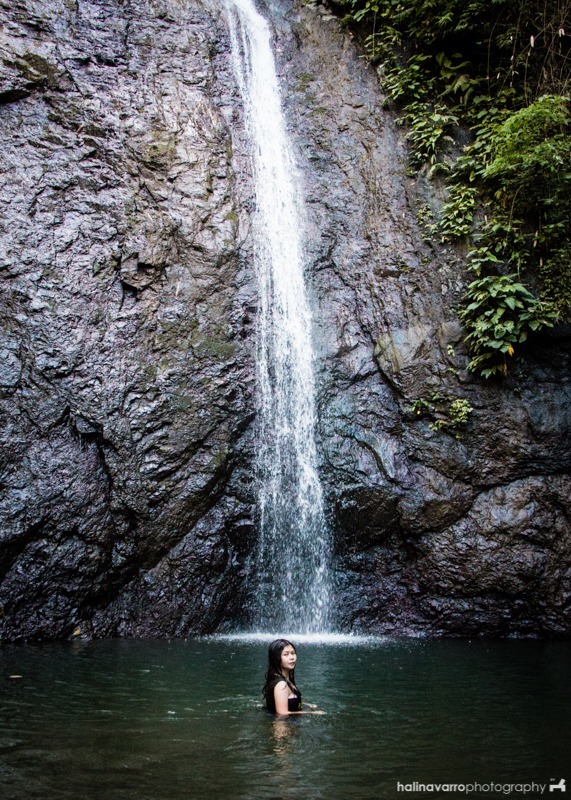 When I saw a photo of a kawa hot bath, I told myself I should experience that for myself! And so, in our Iloilo-Guimaras trip, we went for a little detour to do a day trip in Tibiao, Antique. 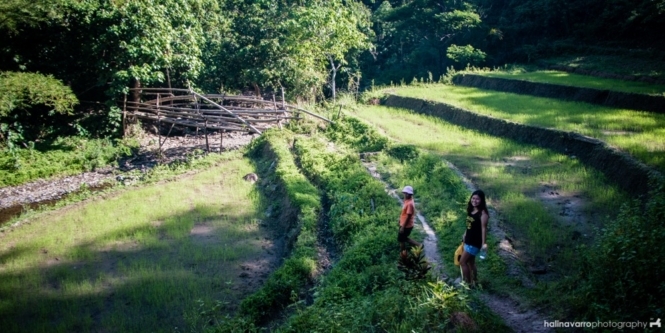 From Iloilo City, the road to Tibiao, Antique, is filled with scenery of endless rice fields and both modern houses and native huts. I thought, this is what being in a province feels like. After 4 hours of easy travel via van and a short habal-habal ride, Hali and I arrived in Kayak Inn, a favorite accommodation in Tibiao. 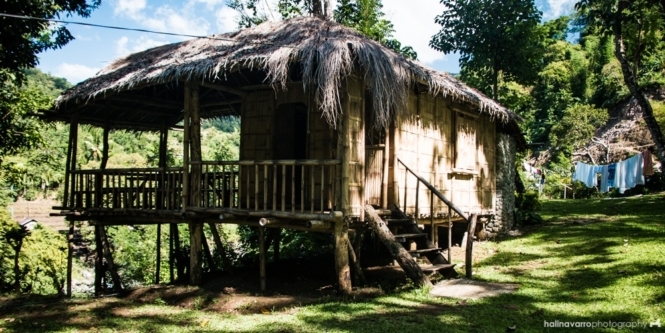 A young lady greeted us and showed us our hut, which was delightfully simple and comfortable. Our room was bare except for a table and a thick mattress in the center. A toilet made of cobbled stones is located at the corner. Everything about our temporary quarters speaks charm. Kayak Inn stands beside Tibiao River, where one can do kayaking activities. The sound of gushing water is very soothing in the senses, especially when we were dining in an alfresco setting and, later on, when we were sleeping at night. We dropped our bags and, after a quick lunch, proceeded to the barangay hall where we would have to register and avail of a guide to the local falls nearby. 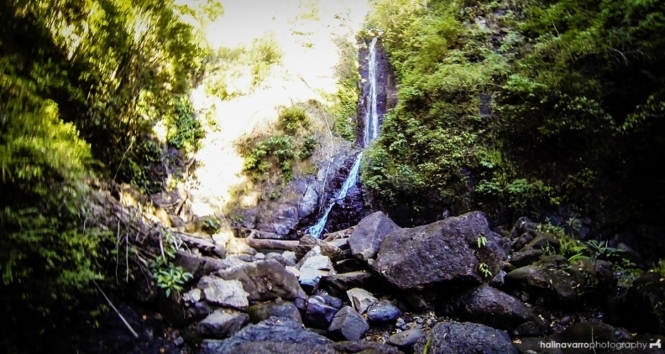 Bugtong Bato Falls is a recently discovered tourist attraction in Tibiao, Antique. It is a seven-tiered waterfall, although the most accessible are tiers 1-3 and as such most tourists only get to see these. From the third tier, it will take about 4 more hours to reach the next level and will require the tourist to take a different route in the mountain. Trekking to the seven-tiered falls normally takes 30 minutes. It starts to become challenging once you get to the first tier. It’s not for kids, for those with fear of steep climbs, for the faint hearted. The falls are cold with a deep green color. The pool in the third-tier fall is the deepest of the lot, about 13 meters. You can climb on the sides and jump to the water. The rocks, however, are slippery so one must be very careful. Hali went barefoot before jumping down the pool. From the first tier, you have to climb rocks that require holding on to a rope for support. It’s a piece for rock climbing enthusiasts. From the third tier, you can opt to go down through the holds beside the second-tier falls itself; the climb is shorter but wet and slippery. These holds are too small and far apart. I had to climb down without seeing where to place my feet. Ate Menen went ahead of me, and she kept assuring me she got me. Midway though, my legs started shaking and I panicked. “Ate, dun na lang tayo sa kabila,” I told her. And so we went down via the rocky climb. All in all it was a challenging trek to remember. It would be nice to go back and visit the upper levels of the falls sometime in the future, although I don’t know if the barangay hall covers visitation to that area as well. A kawa is basically a wok made of thick cast iron, large enough to serve as a tub for a person or two. Here in Tibiao, it’s used as an outdoor hot tub. 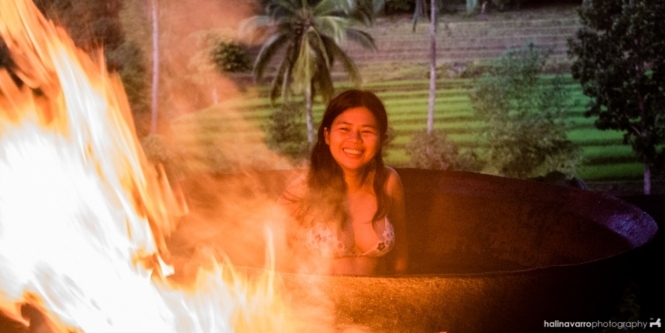 Hali was excited to experience a kawa hot bath in Tibiao as well. I’m not sure if this was for himself or, in his words, he’d simply like to see me get cooked while he threw in carrots and other vegetables in my kawa. It will take about 30 minutes to prepare the kawa hot bath. Spring water is added along with herbal leaves. I think the leaves are called alubihon, although I couldn’t find any reference of this online. The leaves help soothe the muscles. Sometimes flowers are added, too. Hali and I shared a big kawa, and we stayed there for probably an hour. It was peaceful and relaxing, with the darkness slowly creeping in around us. We dozed off. the The water stayed warm all throughout our bath. After our kawa hot bath, we had vegetables for dinner and went to our quarters to finally hit the sack. Even without an electric fan, the night was still cool. The open windows let the air in and let us glimpse a beautiful view of the night sky. Okay, to be honest, Hali was the only one awake to witness the glory of the sky; I was sleeping fitfully all through the night. It was one of the deepest sleeps I’ve had in a while. 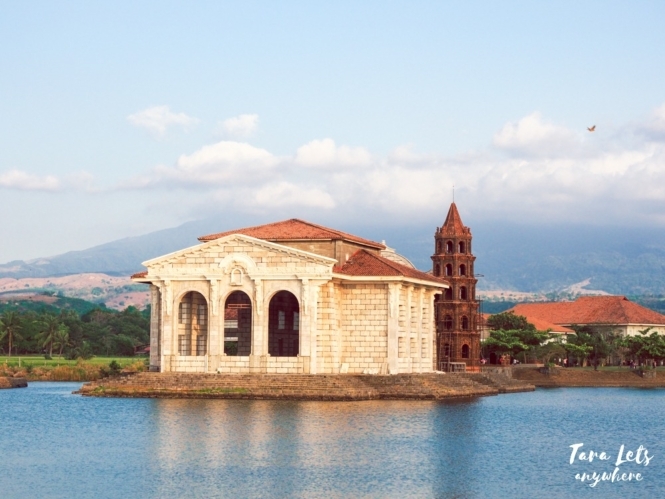 From Iloilo, head over to Molo terminal and board a van (P180 per person, 4 hours) or bus (5 hours) to Tibiao. If you’re staying at Kayak Inn, tell your bus/van driver to drop you off the road going to Kayak Inn. From there, take a habal-habal to Kayak Inn (P70 per person). Take note that, if you’re taking a van, you need wait anywhere from 30 min to 1 hour for seats to get full. 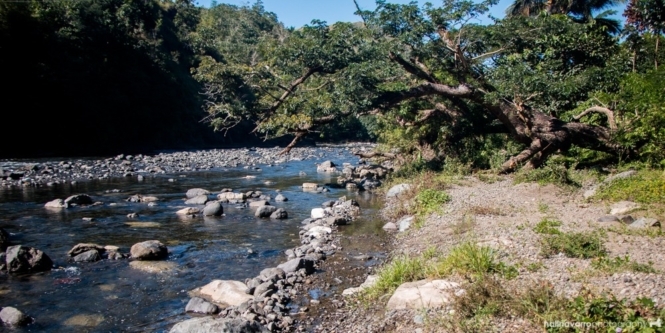 We’d spotted the Tibiao fish spa and bakery just before the crossing to Kayak Inn, so it might be be a good idea to stop there first since habal-habal rides can be costly. We’d contacted Kuya Edwin ahead to make reservations. There is no downpayment needed. Kuya Edwin and the other staff at Kayak Inn were very kind. We got up at about 3:30AM the next day to go back to Iloilo City, and the habal-habal drivers waited for us to get in a van before leaving. It’s your turn to share. 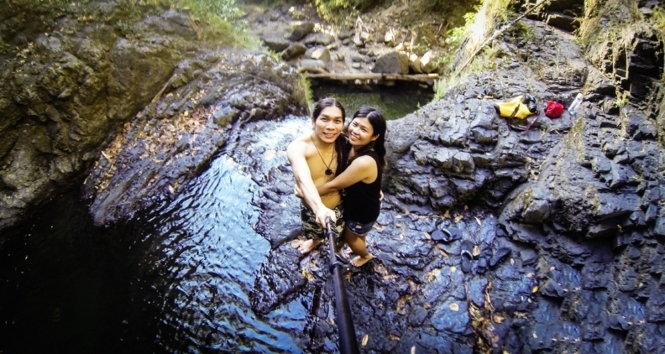 🙂 Have you been to Bugtong Bato falls or experienced the kawa hot bath in Tibiao? Pwede po mag luto sa Kayak Inn? Pwede magpaluto, meron sila cooking fee. Did you prebooked your accomodation in Kayak inn? Or walk in? Agree! Super sarap matulog sa hut nila kahit walang fan.